One thing I have learned a lot about lately is Acne. I am not going to bore you with the facts that I have learned but unfortunately the main fact that I have learned from personal experience is that just because you are no longer a teenager, that doesn't mean that you are immune to acne. Actually, some people are "late bloomers" when it comes to acne and I just happen to be one of them! Oh I love being thirty something...but I don't love being thirty-something with acne! This brings me to share something with you that I have learned recently that I didn't know before. If you did-I am mad at you for not sharing it with me! The other day I was watching the Today Show and they had some make-up tips on a segment on their show and they were talking about blush brushes. 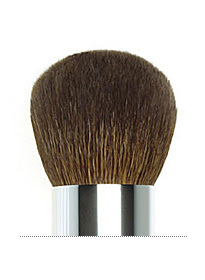 An interesting fact; you need to wash your blush brush! Who knew? You take a little warm water and a mild soap and wash your brush. If you don't, it could cause transfer of dirt into your pores. Which in turn, you guessed it, could cause unwanted acne! What did I do that day? I washed my brushes. Has my acne decreased in the past few weeks since the cleaning? Yes. Unfortunately, I had just purchased at the same time a trial for Proactive in the kiosk in the mall and so I am unsure if the clean brushes are the cause to a clearer skin or if it's the Proactive? Anyhow, lesson learned, Clean your blush brush every 2-3 weeks. This is still a bummer, even if you're 29! I did my research about stuff and essentially the thing I came up with is that acne is caused by bacteria. That's why the stuff in the make-up brushes would be a problem and also why people with significant acne see a dramatic decrease when they use antibiotics. Hey, I watched that too! But I haven't washed my brushes yet - maybe I will! Thanks for the tip. Sadly, I'm right there with you. I don't even use make up brushes. Hmmm. I hear you loud and clear on the acne. And had the make-up brushes and cleaning them thereof topic come up, I most certainly would have shared! Unfortunately I've just never outgrown my acne that started at age 8!!! Yes, eight. I keep hoping that I'll outgrow it but unfortunately you can have both wrinkles and acne. How unfair. I've been a ProActive user for 10 years now, it helps keep it mostly under control. Good tip on the make-up brushes, it's been a while since I washed mine out.